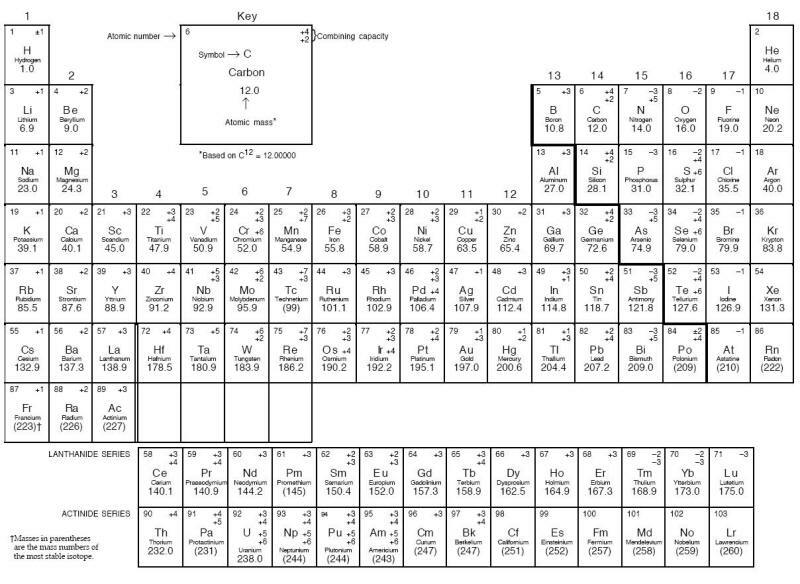 Of the 103 elements in the Periodic Table shown below, approximately 80 are metals, each possessing different mechanical, chemical, and physical properties. Although all these metals can corrode, they do it in many different manners. Furthermore, many of these 80 metals have been alloyed to make tens of thousands of different alloys. Obviously, one person cannot memorize the composition of such a large number of alloys. Reference texts are available to provide such information [4;5]. Periodic Table of the elements. Note: Elements in the periodic table are arranged in periods (rows) and groups (columns). Each of the seven periods is filled sequentially by atomic number. Groups include elements having the same electron configuration in their outer shell, which results in group elements sharing similar chemical properties. The lanthanides and actinides are actually a part of periods 6 and 7, respectively. From a purely technical standpoint, an obvious answer to corrosion problems would be to use more resistant materials. In many cases, this approach is an economical alternative to other corrosion control methods. 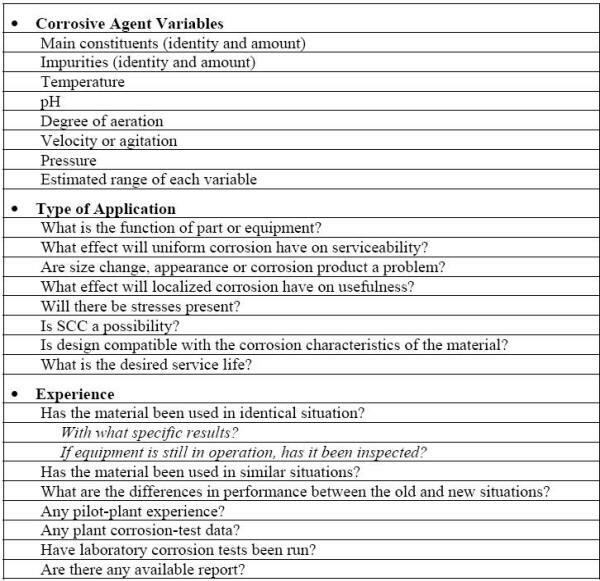 The following Table lists the questions that should be answered in order to estimate the corrosion behavior of materials either in service or considered for such usage . However, the corrosion resistance of a material is not the only property to be considered in making material selection. Choosing the most economical material. 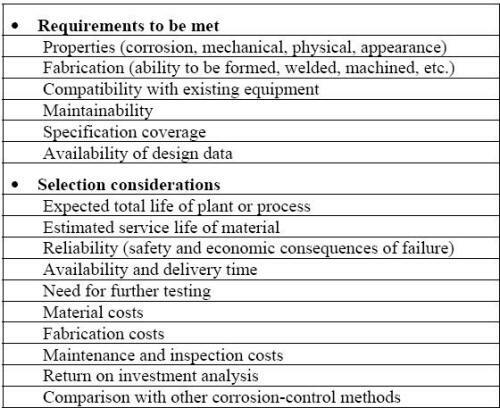 Some particular requirements and typical selection considerations are presented in the following Table. The material selection process is also influenced by the fact that the materials are either considered for the construction of a new system, or for the modification or repairs in an existing facility. For the construction of new equipment, the selection procedure should begin as soon as possible and definitively much before the design is finalized since the optimum design for corrosion resistance may greatly affect how the system will be assembled or constructed. In a repair application, there is usually less opportunity for redesign, and the principal decision factors will be centered on delivery time and ease of fabrication in the field. It is also advisable to estimate the remaining life of the equipment so that the repair is not grossly over-designed in terms of the corrosion allowance. A common form of representing the corrosion resistance of materials is what is known as ‘isocorrosion diagrams’. The use of the prefix "iso" refers to lines (or regions) of constant corrosion behavior across variations in concentration and temperature. The diagram shown in the following Figure illustrates how some stainless steels compare to other metallic materials in industrially important nitric or sulfuric acids and their mixtures . 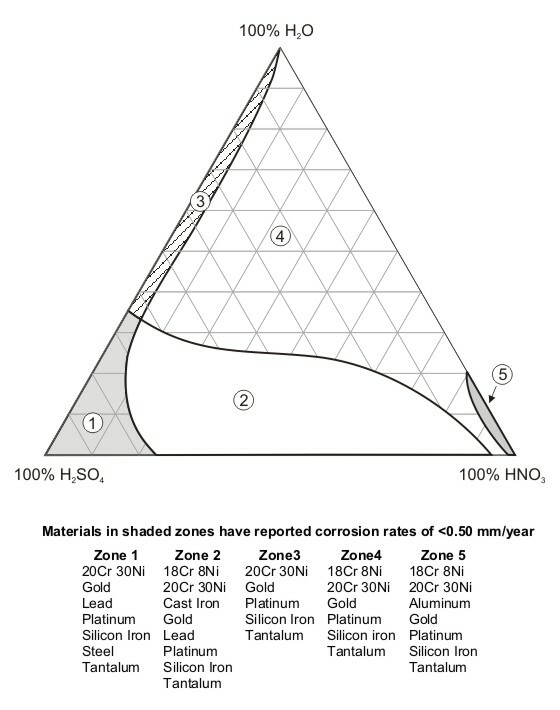 Corrosion Data Survey of Metals  and of Non-metals  are two popular publications using such a scheme for representing corrosion information.In these publications the corrosion behavior of metals is expressed in units of penetration rates, i.e. mm y-1 or milli-inch per year (mpy), while the corrosion behavior of non-metals is expressed in qualitative terms such as ‘recommended’, ‘questionable’ and ‘not recommended’. 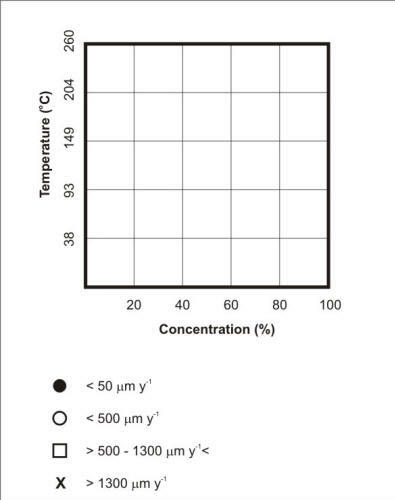 The following two Figures respectively explain how the template in Corrosion Data Survey of Metals is used to express the corrosion resistance of the most commonly used metals and how the template serves to summarize the corrosion resistance of S30400 and S31600 stainless steels in aerated acetic acid service.